We saw it, we felt it too. It was not just about a victory or history that was created but an enthusiasm, patriotism, dynamism poured into her eyes, converged together to glorify 125 crore Indians, swelling the Nation’s pride. The whole World is gasconading the talent uprose from a corner of the Nation which many of us didn’t know even existed. Unfortunately, the most neglected part, the North-East region, in various terms is aggrandized in itself, enriched with the nuts and bolts to your incredulity and she has proved it. 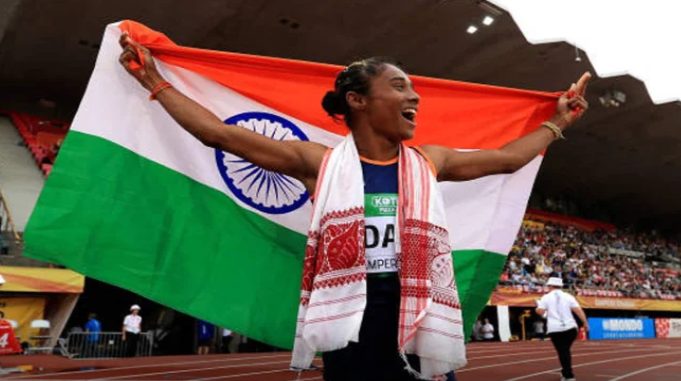 Hima Das, a proud daughter of a proud farmer, won the Gold Medal in the women’s 400m track race under IAAF World U20 championship held in Finland by reaching the point like a hurricane in a time of 51.32 seconds. In the beginning, she was quite slow but in the last 80 meters, she made a dart with the speed of light to hit its ground. However, It was her first International competition but she played well to crave her name on the walls of History by becoming India’s first world gold medallist on track. Hailing from Nagaon, Assam, this proud champion was even unknown to the term ‘Athletics’ in 2016. She was spotted by Mr. Shamsul Hoque (a physical Education Trainer from Jawahar Navodaya Vidhalaya) while playing football on the mud pits near her village school. She was considering football as her career. But to the suggestion of Mr. Hoque, she positively responded and fortunately came into the contact with Mr. Nipon Das, an athlete coach, during an inter-district meet. Later on, she had been shifted to Guwahati city to attain more training under the coach Mr. Nipon Das. She has been accommodated in a rented apartment near the Sarusajai sports complex. Das has won gold in 100m and 200m also. She wore cheap spikes but her talent has found its way itself. A destiny was designed already. According to her coach, he had never seen such a talent in ages. After winning over the world when the National Anthem of India was played in the arena, tears flooded out of her eyes caused goosebumps to all. They said stories, stories of her dedication, two years of backbreaking work, uphill battle and her deep affection towards the country. She wrapped, unfurled the National flag around her shoulders and didn’t forget to wear ‘Assamese Gamosa.’ She gave a concrete reason to believe in oneself. No matter where you belong to or what your plans are? When you are destined to be, opportunity paves its way towards you. You just have to believe in it, consider it and work for it. Results will never let you fall. ⟵Contemporary Indian Writers Who Are Making India Read!